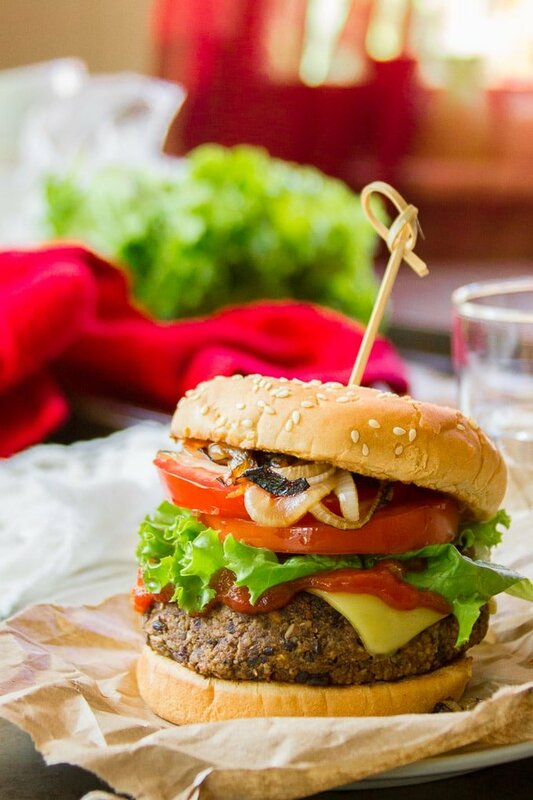 A mix of black beans, rolled oats and walnuts give these flavor-packed vegan burgers a meaty bite, while spices pack in the flavor. 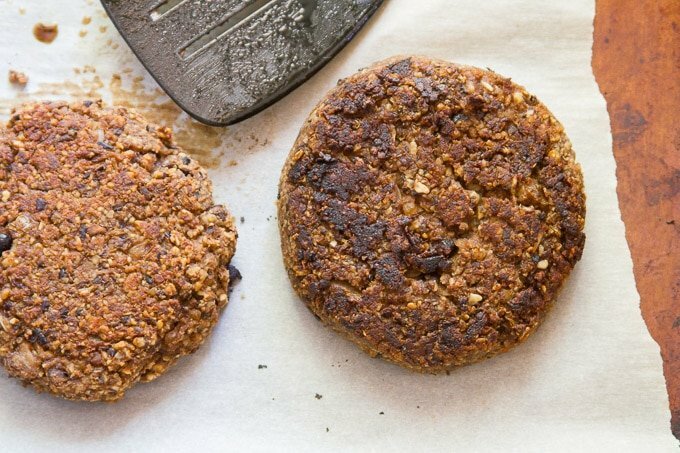 These black bean walnut burgers will please vegans and non-vegans alike! I don’t usually go for meaty vegan burgers. Both when I’m buying premade patties and when I’m making my own, I’m usually a bigger fan of veggie burgers that taste like, well…veggies. Or at least veggies with lots of delicious seasonings! 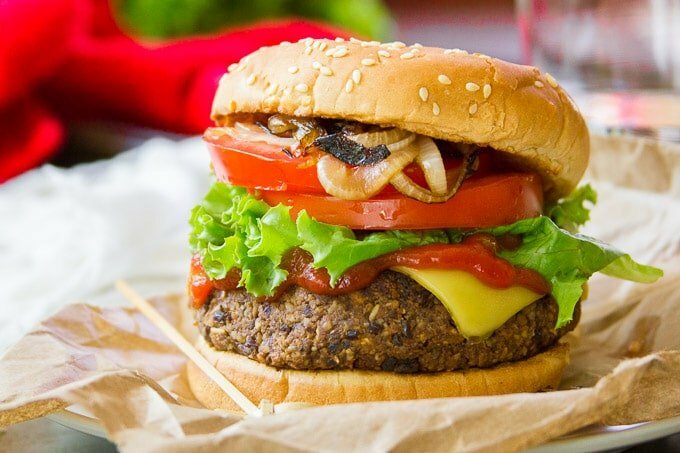 But I’m down with pretty much anything that’s vegan, and I’ve noticed lately that big, hearty, beefy veggie burgers are gaining popularity. And since we’re coming up on a big veggie burger weekend (happy almost Labor Day! ), I decided to see if I could come up with a pretty convincing recipe of my own. Now, in the interest of full disclosure, it’s been a long time since I had a non-vegan burger, and I’ve never tried Beyond Burgers, Impossible Burgers, or any of those super convincing meaty veggie burgers that everyone is raving about. But I still think I did a pretty good job. Would these suckers fool a non vegan? I’m guessing no, but like I said, it’s been a while! Would non-vegans enjoy these burgers and appreciate their hearty bite and savory flavor? Yup, I believe they would! The burgers start with a mix of oats and walnuts. You’ll want to blitz them up in the food processor before anything else, until they resemble coarse crumbs. Add your beans, onion, garlic and some seasonings. Pulse again until the beans are broken up and everything is mixed. Don’t overdo it! You want some texture. I’m normally a pan-fried veggie burger kind of girl, but I preferred these baked. Just shape the mixture into patties, place them on a parchment-lined baking sheet, and bake for 15 minutes on each side. 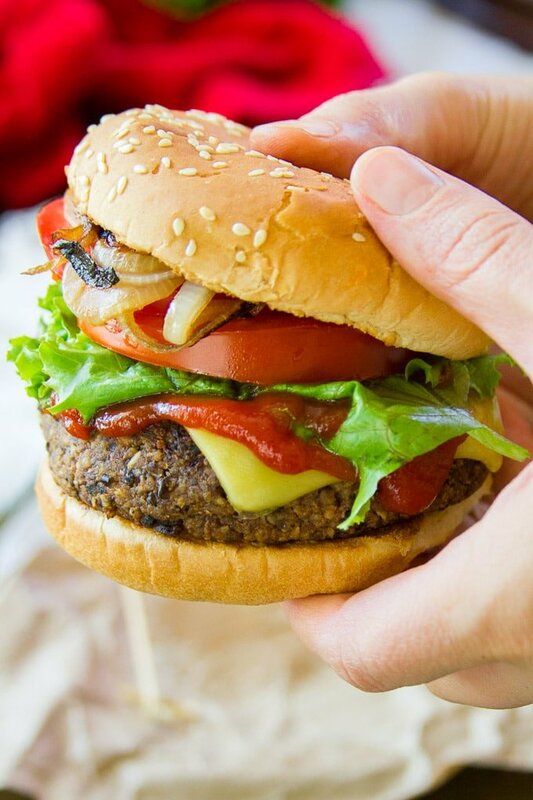 You can top your burgers with whatever you like, but for these meaty burgers I really like the classic toppings: ketchup, mustard, lettuce, tomato, onion, pickles and a slice of vegan cheese (I used Chao brand, original flavor). Want to keep these burgers gluten-free? No problem! Just use certified gluten-free oats and your favorite gluten-free buns. While I prefered these burgers baked, you can pan-fry them if you’re short on time. Just use a lightly oiled non-stick skillet and cook the patties over medium heat for about 4 minutes on each side. Annie’s and Edward & Sons Worcestershire sauces are both vegan. You can also check the ingredients on your store brand — sometimes I luck out and find a vegan one! Give the burger mix a taste-test before shaping it into patties, and adjust any seasonings to your liking. 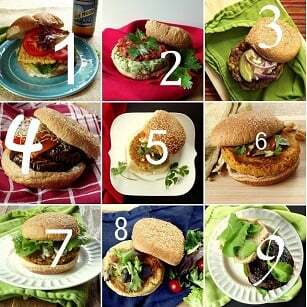 In fact, you can almost always do this when you’re making vegan burgers! The only time I skip it is when the recipe includes wheat flour, which can have contaminants and shouldn’t be eaten raw. 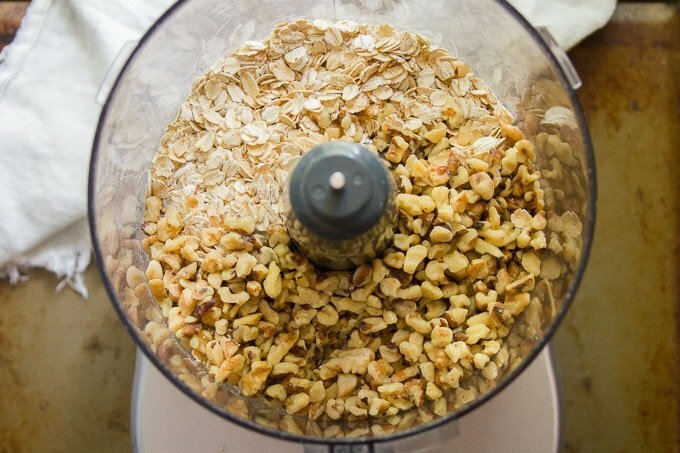 Place the oats and walnuts into the bowl of a food processor fitted with an s-blade. 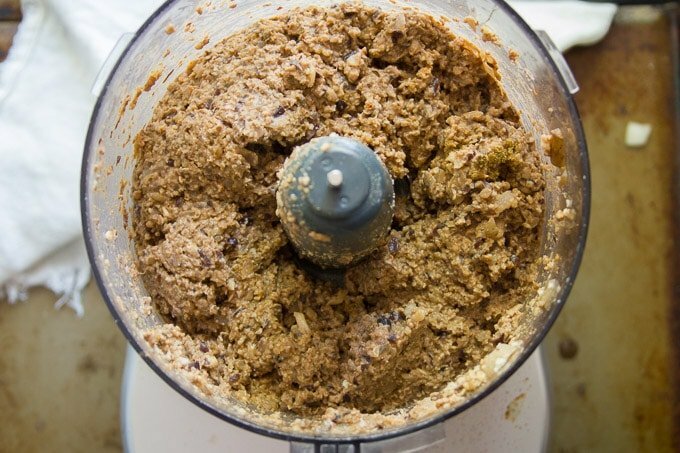 Blend for a few seconds, until the mixture resembles coarse crumbs. Add the beans, onion, garlic, Worcestershire sauce, soy sauce, vinegar, cumin, paprika, and pepper. Pulse until everything is well chopped and mixed, being careful not to overdo it (don't let the mixture turn to mush). Shape the mixture into 6 patties and arrange them on the baking sheet. Lightly brush or spray the tops with oil. Gently flip the patties, spray or brush the other sides with oil, and bake about 15 minutes more, until firm and lightly browned. Stuff into buns and serve with toppings of choice. These burgers look so good, however, I’m grain free. Is there anything grain free I could substitute for the oats ? Potassium 483mg 14% I AM ON DIALYSIS FOR KIDNEYS FAILED ANY HELP YOU CAN HELP ME I WILL APPRECIATE IT. Do you think I could half bake these and freeze them for frying up later? I’m trying to wean myself off the store-bought patties as I am on a mission to eliminate as much plastic as possible from my life. How has your burger-freezing experience been? Yup! I have a couple in the freezer right now. :) You can also mix up the burger base, freeze it, and then thaw, shape and bake when you’re ready. That’s why I’m afraid to try the impossible burger – I’ve had a couple other meat substitutes that were super meaty and freaked me out a bit! When you say burger base, do you mean the walnuts and oats only? I’m going to make these. I’m assuming to freeze I would let them freeze first on a bakng sheet before putting them in a zip lock freezer bag? On a mission to pack my freezer with food! I’m making your jambalaya tonight, it will be my first of your recipes, but certainly not the last. I have saved a ton of them so far!! If you’ve got the freezer space I think that would be a great way to do it! I hope you enjoy these and the jambalaya!! Absolutely amazing. Doubled the batch to keep in the freezer. My picky , non loving black bean son ate these up!! I’m so glad to hear that!! Thanks Lea! Lea, did you cook them before freezing? Thanks! I have tried many vegetarian burger recipes and I really find this is the best I have ever tried so far. I made seven patties instead of six out of the recipe and I think next time I will make 10 or 12 smaller burgers. I added a bit of water and some cornmeal. I also added some whole grain mustard to the mix. These vegan burgers are truly outstanding. Wonderful!! I’m so glad you enjoyed them! Thanks Anne!